In the Summer of 2017 we were approached with an exciting project in collaboration with DesignStudio. The brief: to revisit a Fontsmith Brandfont® favourite, the bespoke Champions font family for the UEFA Champions League that we developed back in 2008. DesignStudio won the covetable opportunity with UEFA to evaluate, evolve and renew the Champions League visual identity. Their objective was to reinvigorate and bring in a more premium, youthful and contemporary aesthetic to one of the world’s biggest sporting events. 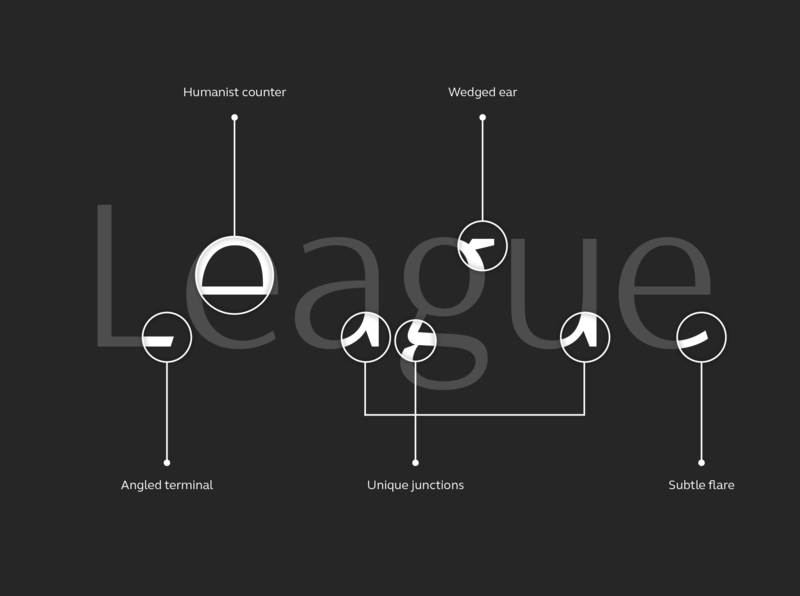 In preparation, DesignStudio had begun experimenting with a Light weight placeholder alphabet based on the Champions font. Conceptually it was working really well in event poster designs and combined with a fresh and illuminating approach to the brands stadium graphics we felt there was a real perception shift afoot for the competition, a sense of an elevated visual language. We popped over to meet with the DesignStudio team and discuss expanding the tournament’s typographic system in order to reflect the new strategic proposal and creative direction for the brand. From a type design perspective this offered us an opportunity to revisit our Champions typeface which was conceived in 2008. DesignStudio’s approach enabled us to explore how a new Light weight companion to the existing Regular, Bold and ExtraBold styles could work in 2018. We set out to create a Lighter ‘Premium’ weight for the competition by extrapolating iterative degrees of lightness from our original fonts, seeing where the font began to break in this new brand world context and to identify areas of the design that needed further attention in order for the type to function across all environments. The horizontal stress and stroke contrast of the caps was a particular issue. We had to test and refine in order to ensure that the thinner forms didn’t become too light when used in small sizes, especially for in game info-graphics such as team line-ups and half-time score cards. Through rounds of testing on various character shapes, design refinements and testing in collaboration with DesignStudio we created a new Light weight style for the family, one that remains sympathetic to the original design aesthetic and type structure yet feels modernized, elevated and more premium. The typeface is exclusively owned by the UEFA’s Champions League brand, it is a hugely important aspect of the competitions identity design system, it’s ownable and unique, delivering a consistent tone across typographic touch points. Read about the original job in our 2008 case study.